Fr. Joseph Marquis, founder and executive director of the St. Nicholas Institute ( www.stnicholasinstitute.org ), portrays St. Nicholas of Myra on the LIVE Monday, December 19, 2016 episode of “At Home with Jim & Joy.” The program, co-hosted by Jim and Joy Pinto is broadcast each week on Catholic Global Television Network (EWTN). Fr. Joseph, a Emmy Award winning professional “St. 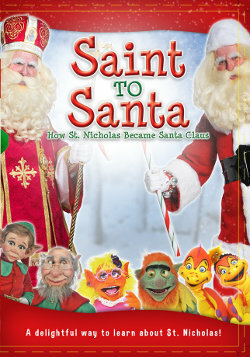 Nick,” has brought the Patron Saint of Children to life for the young and the young-at-heart for 45 years (2016). A DVD of this December 19, 2016 episode of “At Home with Jim & Joy” (Item #: AH179) may be purchased online from the EWTN Digital Catalog.